Rivers and streams cover much more of the planet than geologists previously estimated, according to a new study published in Science. In total, this new estimate shows that, excluding land with glaciers, Earth is covered by just under 300,000 square miles (773,000 square kilometres) of rivers and streams. That’s more square footage than the state of Texas, and it’s as much as 44 percent higher than previous counts. The finding has implications for the study of climate change, because rivers exchange greenhouse gasses with the atmosphere, especially when humans pollute their waters. As pollutants like fertilisers and sewage seep into water supplies, gasses including methane, carbon dioxide, and nitrous oxide bubble out and drift up into the atmosphere. More river coverage could mean we’re sending even more of those greenhouse gasses into the air than current calculations account for. To map out the planet’s rivers and streams, University of North Carolina hydrologists George Allen and Tamlin Pavelsky analysed thousands of images from a NASA Landsat satellite. Using software developed by Pavelsky, the duo ended up with 58 million river measurements they then used to calculate the total coverage of rivers and streams on Earth. The researchers estimated river shapes by measuring their widths, as shown here. Aside from their Texas-sized estimate, the researchers also found that rivers were both narrower and more sparse in human-developed areas, which surprised them. This could be because people are siphoning water for agriculture, draining swamps, and leveeing rivers, but more research will have to be done to say for sure. Other scientists have made estimates of Earth’s river and stream coverage in the past. Downing, for instance, used the distinct way rivers branch and how much water they move to estimate their global coverage. Others have used elevation and water runoff data to do it. 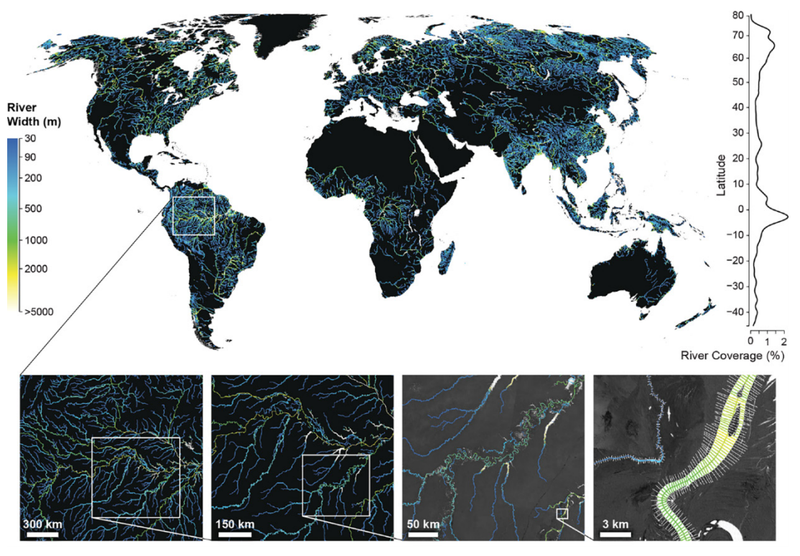 But none have shown river morphology — a river’s shape and direction—like this satellite estimate does, the researchers said. Downing was impressed by the number of data points Allen and Pavelsky considered, and found their results exciting—especially because the duo’s estimate was within 15 percent of his own. Having a map of Earth’s river morphology may prove extremely useful when predicting floods, Downing added, or for studying the way rivers behave in the future as the Earth warms. Plus, now that this fine-tuned, river-measuring technique has some reliable results, he said it could be useful to see how river flow rates change from season to season—another good data set to have when working to keep communities safe from floods.